By Jake Rocheleau in Web Design. Updated on November 29, 2018 . If you’re a webmaster then you should also have a keen interest in tracking site statistics. Likely you’ve heard about or even used Google Analytics for certain time. It really got some serious awesomeness for webmasters, and for most users the general tracking data is enough to pull sound conclusions. However, like Google pointed out, real Analytics Ninjas use goals. With Google Analytics, you can create artificial goals and apply them to your web traffic to determine the success or failure rate of visitor’s actions. Goals can even put your mind at ease by tracking the completion of tasks by your visitors. 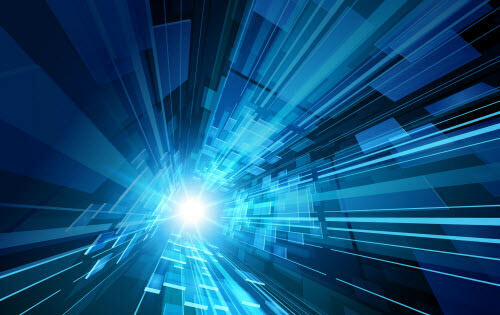 They are abundant in Analytics and provide exceptional data to look over. The process sounds a lot more confusing than it seems, but I’ll be going into much greater detail in this guide with comprehensive explanation. So if you’re interested to track and analyze data better in order to make your site more awesome, this is the guide for you! I should start out by defining two very important keywords. 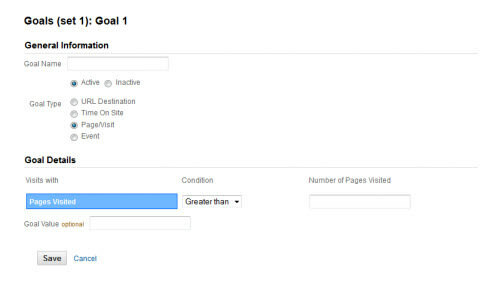 Goals are visitor tracking method which you can set them into different criteria on your website. In general you’ll be checking the rate at which a visitor completes any goals you setup. As an example you could set a goal to unlock after a visitor reaches your contact page, “/contact.html“. If you have visitors coming to your home page and leaving right away, then they did not view your contact page. This could be counted as a failed goal marker or simply a gray area. Visitors who did happen to land onto your contact page will be recorded as successfully completing the goal. You can check the statistics further such as total time spent on the page and total pages they visited. A funnel is actually an optional piece to setting up goals. When you are looking to track which pages your visitors land on it may be important to also track their path into the page. These are defined as funnels, as you’re setting up a pathway to track if the visitors walked the same pathway. Funnels will restrict the amount of completed goals to only those who follow through the entire pathway. It is possible to set up multiple funnels for a single goal, but these can build up quite dramatically and become a confusing mess over time. 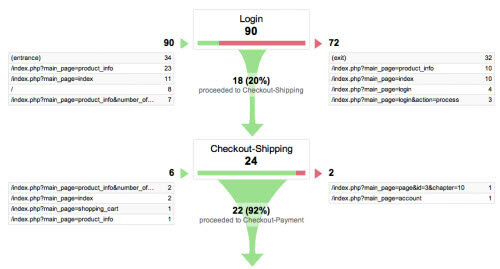 It’s much simpler to track 1-2 funnels (or none!) for any goal you create. As an example, you may track how many visitors download a specific .zip file from your home page vs. article page. Hopefully you are clearer on what goals are accomplishing and why you would want to use them. With that in mind we can now log into Analytics and set up some basic examples! It’s important to note that Google is still building these features into the Analytics backend. For that reason the user interface does not let you delete goals once you create them! You can turn them off, but they’ll always be tied into your profile. It is crucial for you to spend some time contemplating what you’re looking to track. 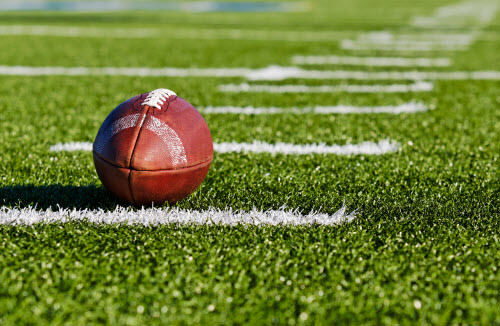 Don’t set up goals on a whim of social marketing fever. I’ve constructed some important concepts to think about in the list below. What information is most important for you to track? Is this just for knowledge, or for potential changes of how your website flows? What are you expecting your visitors to do once they reach your website? What is considered “successful” to you? Completing a purchase, long periods viewing your site, newsletter sign-ups, 10+ total page views, etc? Could you change anything in your design to influence visitors towards completing these goals faster/easier? Now don’t feel trapped that goals will forever be locked up in your Analytics. In fact the data is quietly tucked away into the portion of your Analytics Dashboard under “Goals”, and you can always go back to edit your goals and change the criteria. So honestly you could just set up 1 goal and always change the information for tracking different data when required. To get started log into your Analytics account and find the profile you wish to add Goals into. If you have multiple accounts you’ll need to first click the parent name before you can see the profile listing. In the right side of the column under “Actions” you’ll see links to edit and delete your profile. Click the “Edit” link to open your profile settings and you can see the column titled “Goals”. Now you just need to select a Set which contains your future Goal. There are a total of 4 possible sets which each can hold 5 goals respectively. It isn’t required that you utilize sets in any particular fashion. They are merely ways to separate tracking data into categories such as checkout system, user profile, and blog views. 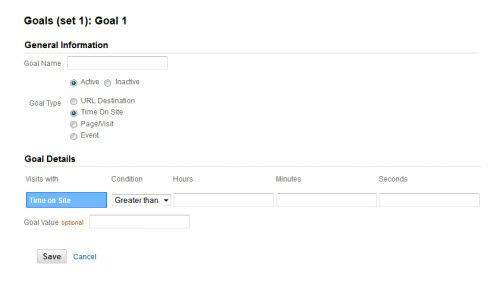 For the new version of Google Analytics, all you need do after accessing into the Analytics is click on the “Gear-like” button located on the top right side of the page (under the “Sign Out” link), then choose your account and web property, and you are in the section that contains Goals. If you’ve clicked to setup a new goal you should notice the form looks fairly straightforward. You are first prompted to enter a name and select if the goal is Active (On) or Inactive (Off). The Goal Position (does not exist in the latest version of Analytics) is set by default to list one after the other, so you can likely ignore that area entirely. What are these four items labeled “Goal type” then? Each goal type represents a different style of tracking your completed goals. I’ve gone into details of the four methods below, but if you want more info I recommend Google Analytics Help on Goal Types. Most commonly you’ll be using URIs to set up new goals. 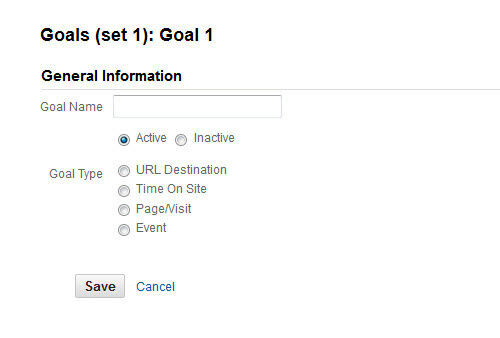 These goal types simply track when a user enters a specific page on your website. The URI component is actually not your full website URL. 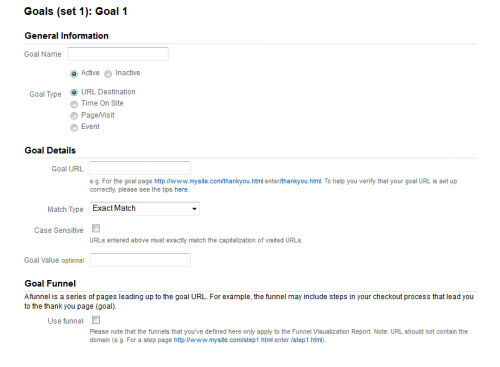 Even though the Analytics menu uses URL it’s much easier tracking goals with only an URI component. This basically consists of everything after your root domain including the final trailing slash. So instead of tracking https://www.hongkiat.com/404.html you would enter /404.html as your URL. You may notice that after selecting this type another sub-class of the form opens up. You’re now asked to choose a match type for your URI. This determines a few different ways to match the pages requested as completed goals. There are three options here which define how Analytics will record a successful goal measurement. Exact Match requires the user to enter the page exactly as it’s been typed into Analytics. This means no extra query strings or question marks or wildcard characters will be allowed. Head Match is a bit looser which targets pages with identical characters starting from the beginning point with no specific end. In this scenario extra metadata passed to the URI from web clients such as Gmail, Twitter, or MailChimp will still be counted as a successful goal completion. Regular Expression Match use wildcard terms to select a variety of URL types. Use this to track much more convoluted data such as all pages within the /blogs/ directory. Google Analytics Help has a great article on using regular expressions pertaining to Goals. Instead of checking which pages your visitors are landing on you can instead check their time limits. Maybe it’s important for you to see if visitors are watching videos or browsing photo galleries for more than 5 minutes. This could also include visitors who are reading articles or blog posts. With this goal type you set a length of time in Hours/Minutes/Seconds which Google Analytics will apply to each visitor. You then select a Condition: Greater than or Less than the time you put in. In this way you could also check bounce rates seeing how many visitors will only stay for a couple of seconds before leaving. Similarly you can set goals tracking the amount of page views per visitor. The form is set up in a very similar manner as the goals above. Each individual is tracked for the amount of pages they view per visit and will only complete your goal if they are above or below the number you set. If you want to track a specific action such as a click on the download button for your icon pack, Event (only exist in latest version of Analytics) is for you. With Event as goal types, there are 4 event conditions for you to set up the goals: Category (e.g. download), Action (e.g. icon pack, interface pack), Label (e.g. vector, non-vector) and value (e.g. 10, 20). You can configure one or more event conditions. Besides, for Event goals you can either use the actual Event Value or a constant value which requires you to manually enter the value. 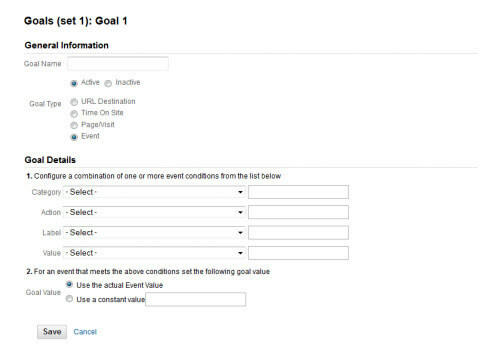 As this is the new goal type comes with the latest version of Google Analytics, you can refer to its official guide, The New Google Analytics: Events Goals. Actually with each of these four types you can set an optional goal value. So either way Analytics will be tracking the data from your visitors, but if you have an ideal range in mind (such as 10 pages per visit) you can set this in the Goal Value form. Analytics will convert the data and display how many completed goals have hit this exact value. Once you understand the criteria for creating goals the task becomes much simpler. It’s even a slightly exhilarating process to try out new goals and goal types among your website traffic, but now you may wish to consider taking things into the next level by defining funnels for your goals. It should be noted that funnels will only work with URI goal types. You cannot have funnels for page views or total time per visit since there isn’t a specific pathway to follow. The purpose of defining a funnel system is to create a targeted map for your traffic to flow through. So in order for a goal to be completed (such as somebody visiting your contact page) originally the visitor would only need to land on the given URI. However with a funnel the visitor must enter your page as specified in the Goal Funnel section for the goal to be counted as complete. Funnels could include more than one page to follow through as well. You would use these in a scenario such as checkout of a shopping cart. Your visitors should follow through the paths in a specific order such as viewing the cart contents, placing the order, entering shipping details, and finally entering payment details. You may even track if they land on a final confirmation page after their purchases. The system for reading URIs is fairly complex. It can take in regex code to determine a series of pages deemed acceptable for your funnel. You are ultimately limited to 10 funnel steps, but remember the entire process is optional! You could ignore the option if it isn’t necessarily needed. Goals are a much more simplified system for webmasters. Those who are getting into adding funnels are generally looking for much more complicated data patterns. One such reasoning could be to streamline the process of visiting your website. Depending on the type of site you may have a set of specific goals in mind. Maybe you’re trying to get readers signing up for your newsletter or connecting into your site via Twitter. Both of these tasks offer redirect links which you can send visitors after they’ve completed the process, but you may wish to see how many visitors are signing up directly from your home page vs. all other pages. Adding funnels will provide much more purpose if your goals require a set of intended paths. Additionally if your site is pulling only a few hundred visitors per week the sample size may be too small to notice any emerging patterns. Stick to using funnels when you have a purpose for testing the routes your visitors are taking to complete goals. They can be very rewarding when they’re used properly and provide exceptional reports to help with UI updates. Just getting started you may easily get confused by some of the terms between goals and funnels. It’s certainly a tricky subject, but keep pushing if you’re interested. There is a lot of great information to gain from keeping track of your visitors’ page requests. Not only can you determine the most popular content but also weed out possible UI glitches and bug fixes within your template.